Apple's new Maps are a huge leap over iOS 5 maps in pure technology: the use of vector maps (mathematically described, resolution independent map information rather than static bitmapped pictures of map tiles) enables fast, sophisticated navigation of 2D and 3D views with fluid panning, rotation and perspective, in contrast to the flat, static map images provided by Apple's previous version of the app. Using vectors also results in much less data use (an estimated 80 percent less), as your iPhone can download large areas of maps faster (eating up less of your data plan and battery). The efficient outlines can also work offline far further after you lose your data connection. For example, while iOS 5 Maps would load Google's map tiles of the immediate area being browsed at a couple zoom levels for offline browsing (generally less than a 10 mile radius), Apple's new vector maps, once loaded in San Francisco, allowed us to browse an entire continent of high level maps (state outlines) while offline, north from Anchorage, Alaska to Lima, Peru and from Honolulu, Hawaii to Montréal, Canada. This vastly expanded new capability allows travelers to load detailed maps for a very large area and navigate around via GPS, which remains active even if you turn mobile roaming off (or lack wireless service in that location). Under iOS 5, it was tricky to maintain 2D cached map tiles for even significant part of a single city. Even more surprisingly, iOS 6 Maps also loads basic satellite images and major city labels for the entire globe. When you switch to hybrid mode while offline, Maps overlays its cached vector road paths and city labels over higher quality satellite images that let you visualize the Earth's topography in useful detail over more than a 100 mile (160 km) area, also in 3D perspective view. When taken offline, the old Maps under iOS 5 wouldn't show anything beyond the local, bitmapped map tiles already downloaded, nor any portion of the rest of the globe, even on a basic level. Additionally, the static, bitmapped nature of iOS 5's Google map tiles meant that even if there were some standard and satellite images cached, the app couldn't layer them together to present a hybrid view (and it also lacked any ability to show those maps in 3D perspective). Native apps by Google and Nokia (for Android and Windows Phone, respectively) also use vector maps, but their web sites available to iOS users still use bitmapped tiles. The technology to support vector maps in a web browser (WebGL) isn't quite there yet, and so far is still pretty taxing even for desktop computers. 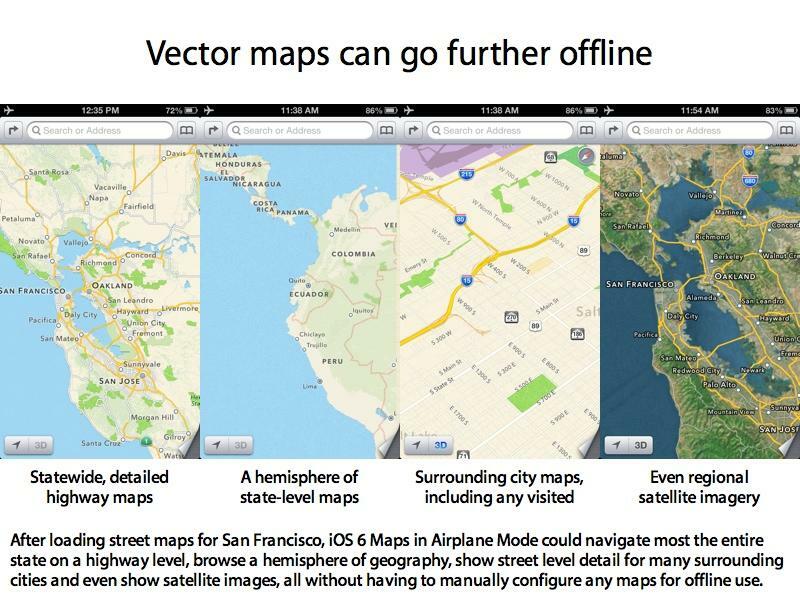 To bring vector maps to iOS 6, these companies would need to offer a native app. Conversely, the web's current limitations in supporting 3D vectors also suggests Apple has no immediate plans to bring its iOS Maps to the web (like Google and Nokia have via bitmaps), although it may deliver a native Mac app (or integrate features into iPhoto's geotagging Places feature, for example) for desktop users. 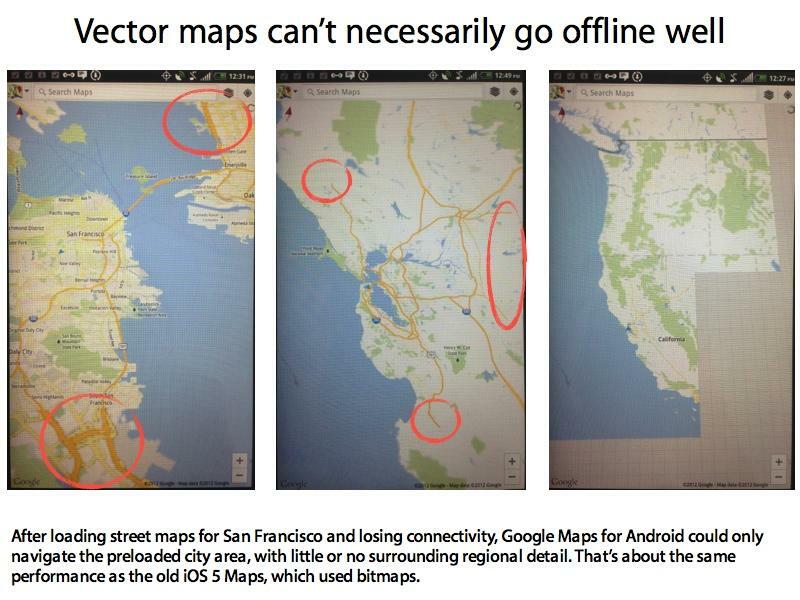 If Google does port its Android maps to iOS, it will certainly also use vectors. However, Google's existing native app for Android doesn't currently offer the same kind of benefits Apple's new Maps has; when taken offline after loading maps around San Francisco, Google's native Android Maps could only zoom out enough to show the most basic state boundaries for part of the northwest U.S. (zooming out any further, we lost any coverage for California). Rather than showing navigable road detail for most of California as Apple's Maps do, the latest Android Maps, despite vector support, could barely cover the 49 square miles (126 sq km) of San Francisco after losing connectivity. Major highway routes degraded to a blocky mess within ten miles of our loaded location, and even city names disappeared after 40 miles (64 km). Highway 101 vanished into dead ends just 70 miles outside of San Francisco. 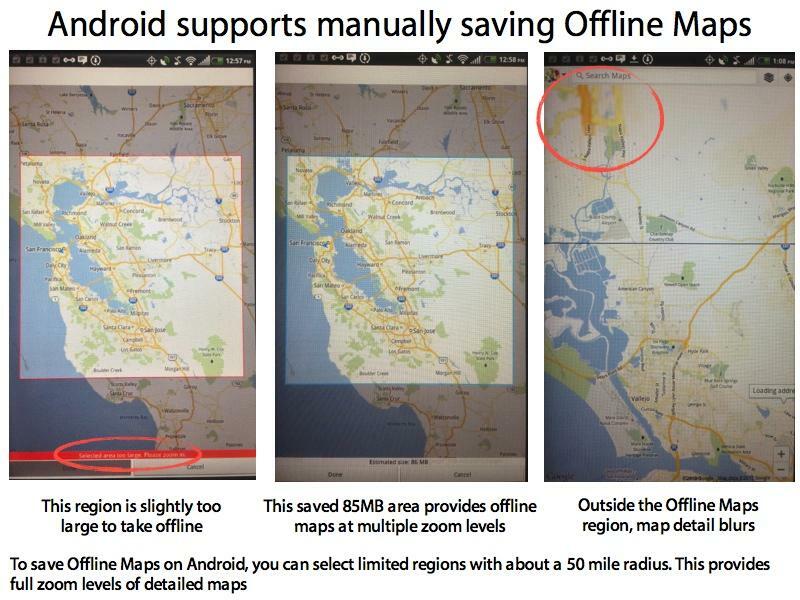 Offline Maps, a new feature in Google's Android Maps released this summer, lets you manually select a regions you can save to your device. However, Google limits this support to an area of about a 50 mile (80 km) radius. Google provides full detail for offline map regions, but the area of coverage is much less than Apple's iOS 6 Maps caches automatically. Just outside the manually saved offline region (indicated by the horizontal line in the third image, above), Android Maps degrade into an unusable blur just 40 miles away from our location. Apple's automatically cached offline maps gracefully scale down in detail to remain useful, a much better implementation of vector map technology. To capture greater detail of specific areas for offline use in Apple's iOS 6 Maps, all you have to do is zoom in on the regions you want to view offline. After zooming into street level maps in Fairfield, Santa Cruz, Antioch and Sacramento, the new Maps allowed us to zoom back in at the same level of detail to all those areas once offline. Additionally, Android Maps will not allow you to bring up its layers menu without a data connection, making it impossible to try to load satellite images or a hybrid view for offline use, even for areas captured with the Offline Maps feature. If Google's latest version of Android Maps is any indication of what it will offer iOS users, it needs to put a lot of work into its vector maps imaging to catch up to Apple's technology in Maps. At the same time, we'd like to see official support for saving offline maps of specific areas within iOS 6 Maps, because it's not clear how long or how much detail Maps saves for you after you've browsed a region. There's no doubt that the "automatic offline support" in Apple's new Maps is infinitely better than the old iOS 5 Maps, however. It's also surprising that Apple hasn't made available for sale specialized packages of offline maps, such as national parks or regional trails, hiking and camping maps, and similar detailed, offline maps for iOS 6 users. In addition to better handling of offline maps, Apple uses its new vector maps to progressively reveal detail on the map, as the next segment details.